We are one month into 2018, and the typical January grind after the holidays is behind you. Now is an appropriate time to give your portfolio attention. It’s not easy to shape market views with so much information (and sometimes panic) floating around with conflicting opinions from analysts. This article aims to provide a summary of the main themes and risks for the year, and I will float some ideas that could make 2018 a strong year for your portfolio. The first major theme to note is the reduction of stimulus from central banks. The US Federal Reserve has started unwinding its balance sheet, effectively reducing the money supply in the US. The Fed is also busy hiking interest rates, with three expected for the year, and this should reduce consumer spending. This action is being taken to keep inflation in check and prevent the economy from overheating. Inflation in the US is therefore one of the major risks to markets this year, as accelerated inflation would lead to more aggressive rate hikes. It could see the end of accommodative monetary policy, causing a negative reaction by markets. Currently there remains robust growth in the US, so you would want to be invested there, but that underlying inflation risk means the return this year will probably be more modest than in 2017. Europe is on a similar path, with the European Central Bank indicating that it will likely stop its stimulus this year, reducing the amount of money supply injected into the economy. The US economy is expanding at a rapid rate and is seeing higher inflation and rising interest rates. 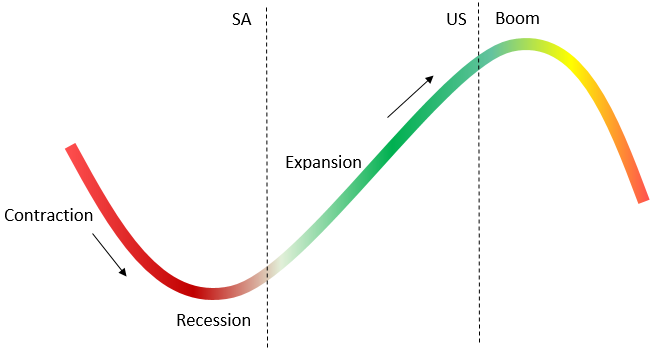 The estimated position on the business cycle is indicated in Figure 1 below. A full cycle can run for years, and it’s likely that we will see another few years of expansion in the US. South Africa is entering an expansion phase where interest rates and inflation is low. The country is desperately trying to spark some growth into the economy and reduce unemployment. The way to do that is by encouraging businesses to start investing, and that is exactly what new ANC President, Cyril Ramaphosa, has done at the World Economic Forum in Davos recently. The current tone from global investors seems to point to South Africa as being the 2018 growth story in the Emerging Markets space. The SARB is forecasting 1.4% real GDP growth for 2018, a good improvement from the sub 1.0% growth of the last two years. The positive change of leadership is encouraging, and following years of sideways market growth and a softer currency, we may see an uptick in valuations on the cards (especially the SA Inc companies generating revenue locally). Rand strength is expected to continue, even appreciating as far as R/$11.50, and current bond yields give you over 3% return above inflation (real yield). 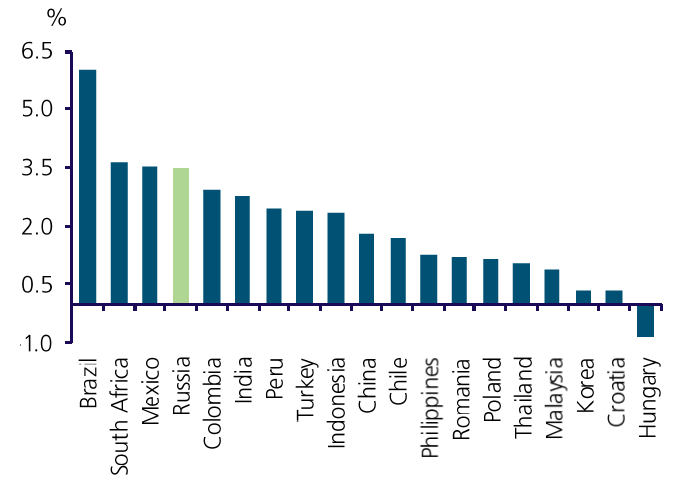 That is large relative to other countries, so there are definitely some opportunities across multiple asset classes. At the start of 2016, the signs of a recovery in global economic growth showed itself in industrial metals. Prices started increasing, and resource companies dug themselves out of a slump that knocked the sector hard in 2015. The global growth backdrop should continue supporting industrial metals in 2018 and further boost corporate earnings in the sector. Quality mining companies reversed losses in 2016 and doubled profits in 2017. The spot prices of commodities are already above average prices last year, and are expected to increase, resulting in further earnings growth for well-run mining companies. Copper, aluminium and zinc are some of the metals to watch as these base metals enjoy rising demand associated with robust economic growth. Demand for these commodities will be greatly affected by the growth story in China, which may be modest this year, but even modest should be enough to support prices. One of the commodities to steer clear of is iron ore, which has been under pressure in the latter half of 2017 due to record stockpiles in China. Then there is gold, a haven asset for anyone fearful of a market correction, an anticipated event given how long equities have been climbing consistently. Recent large swings in global markets highlight that fear, and gold is there to benefit. The longer-term prospects for gold do not look that rosy. Global bond yields are rising and this can be viewed as an opportunity cost for someone thinking of holding gold. Gold doesn’t pay interest, and higher bond yields means more interest foregone to hold bullion. This year may present an opportunity to be a little more hands-on with your allocation between asset classes. I’m not saying go meddle unnecessarily with your pension fund - long term asset allocation is there for a reason. My notion is simply to form your expectations for the year and then take profits when they are met. For SA equities, we anticipate an average year of 15% growth, which means if this target is met in April, we will look to switch some of our equity into another asset class. Equity takes a volatile path and there may be another opportunity a few months down the line to re-enter the market with room for 10% upside before reaching your expected level of 15% again. You can use that same approach with different equity sectors. If mining companies rally and present you with an opportunity to take profit, then jump on it. 2018 is not going to be a year that shoots the lights out, but if you stand on the side-line you are probably going to feel left out.